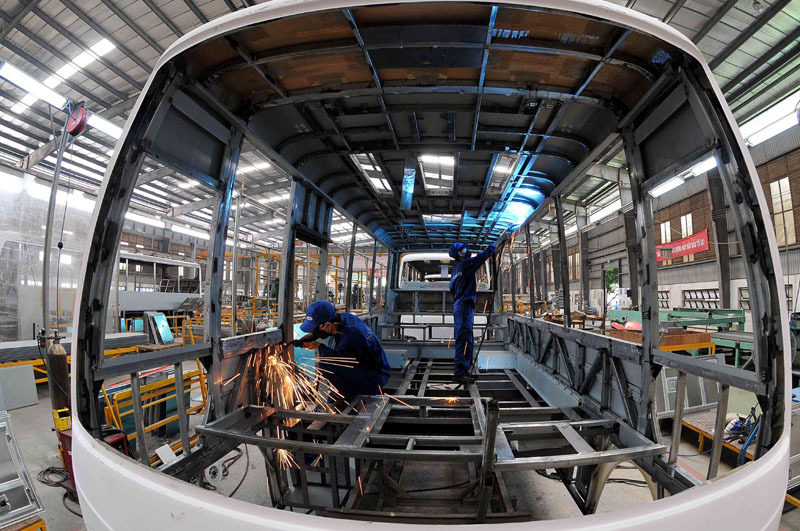 HA NOI (VNS) — Viet Nam's index of industrial production (IIP) grew by 9.4 per cent year-on-year in the first four months of 2015, the General Statistics Office (GSO) has reported. The GSO economists said that the encouraging IIP growth in these four months, double than what was recorded in the same period last year, was spurred by the significant rise in the industrial consumption index in the first quarter of the year. It rose by 13.9 per cent, considerably higher than 5.5 per cent during the same period last year. This significant rise in the industrial consumption index also resulted in IIP increases in case of several industries. Among them were mobile phones that reflected an 89 per cent rise, , motorized vehicles 58.4 per cent, television sets 41.8 per cent, and paper production 20.8 per cent. Other industrial sectors that posted industrial production hikes during the same period were leather and footwear (24.7 per cent), food for aquatic products (23.9 per cent), rolled steel (17.3 per cent), chemical paints (17.8 per cent) and electricity production (11.1 per cent). Moreover, till April 1, the inventory index increased by 11.3 per cent, lower than the 13.9 per cent growth recorded during the same period last year. Also, some industrial products that showed lower levels of inventory included furniture (39.5 per cent), tobacco (19.9 per cent), electronic equipment (14.2 per cent), and chemical goods (11.8 per cent).